Click on the above thumbnail for a map of Northern Ireland's trunk road network. 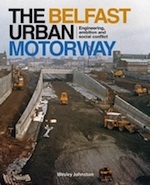 This web site is dedicated to Northern Ireland's road system. Here you will find details about plans for new roads, as well as details of our our existing motorways and dual carriageways, and old schemes that were either completed or abandoned. Please use the links on the left to explore the content of this site. This is not a protest site, but rather a privately run information site for anyone interested in our road system. This site is not associated in any way with DFI Roads or other government departments. I also run a separate blog where I discuss a range of road-related topics when I can.